Figure 1: Cylinder foundation deposit of Nebuchadnezzer in Glencairn’s Ancient Near East gallery. Terracotta, Neo-Babylonian, early sixth century BCE (01.IS.77). 2,500 years ago an eight-inch tall clay cylinder, now in the collection of Glencairn Museum, was deliberately deposited in the ground, out of sight of human eyes. Its lengthy inscription in cuneiform script celebrates the achievements of Babylonian king Nabu-kudurri-uṣur II (meaning “The God Nabu, preserve my heir”) as he renovated and rebuilt various temples and public structures in the already ancient city of Babylon, some fifty miles south of Baghdad in modern-day Iraq. Despite the staggering chronological distance between us and this artefact, Nabu-kudurri-uṣur should be familiar: under the garbled name Nebuchadnezzer, he has passed into our own cultural memory. In this essay for Glencairn Museum News, Dr. Eva Miller, Teaching Fellow for the Ancient Middle East at University College London, will explore the religious, archaeological, and architectural contexts of Glencairn’s remarkable Cylinder of Nebuchadnezzer. In the Hebrew Bible, Nebuchadnezzer appears as an arch-villain, the foreign king responsible for the Babylonian Exile of the Jews and the destruction of the First Temple in Jerusalem. In this role, he is remembered in the traditions and sacred texts of religions that are practiced by millions of people around the world today. Despite its venerable age, Glencairn’s Nebuchadnezzer Cylinder (Figures 1 and 2), dating from the early sixth century BCE, is actually one of the more recent objects on display in the Museum’s Ancient Near East gallery; the oldest inscriptions in the gallery were written about 2500 BCE. Figure 2: Detail of cylinder foundation deposit of Nebuchadnezzer in Glencairn’s Ancient Near East gallery. Terracotta, Neo-Babylonian, early sixth century BCE (01.IS.77). When Nebuchadnezzer oversaw the creation of the Cylinder now in Glencairn, he was fully aware of its place in a long tradition of Mesopotamian royal inscriptions. In the 145-line text (Figure 2) written around its curving surface in Akkadian (a long-dead Semitic language), Nebuchadnezzer speaks of his own encounters with the ancient past. Searching for the original foundations of a temple under renovation which “no former king had seen since the distant days,” he reports that “I found (the original foundations), and firmly fixed its foundation on the platform of Naram-Sin, a remote ancestor. I made my inscription and put it in its interior.” In another inscription that describes the same renovation, Nebuchadnezzer elaborates: “I made a trench searching for the old foundation deposits [. . .], and I found the foundation of Naram-Sin, the king of Babylon, a remote ancestor, and I did not remove his inscription, but put my own inscription together with his inscription” (Da Riva 2008: 27). “I removed the debris of that temple, looked for its old foundation deposit, dug to a depth of eighteen cubits into the ground and then Shamash, the great lord, revealed to me the original foundations of Ebabbar, the temple which is his favorite dwelling, by disclosing the foundation deposit of Naram-Sin, son of Sargon, which no king among my predecessors had found in 3,200 years” (Beaulieu, “The Sippar Cylinder of Nabonidus (2.123A),” in Context of Scripture, ed. W. Hallo). Figure 3: Victory stele of Naram-Sin 9068.jpg by Rama, Wikimedia Commons, CeCILL. Unfortunately, Nabonidus was off by a considerable margin—Naram-Sin actually ruled about 2254-2218 BCE, closer to 1,600, not 3,200 years before Nebuchadnezzer and Nabonidus. Age inflation aside, a long time, nonetheless. Naram-Sin would have occupied a similar position in Nebuchadnezzer’s cultural consciousness that Nebuchadnezzer occupies in ours today: a venerable figure of such antiquity that he dwelt somewhere between history and myth. The grandson of the equally long-remembered king Sargon of Akkad, Naram-Sin was an ancient king of a great empire (although he was also credited in literary tradition with being the king who triggered the demise of the powerful Akkadian Empire). “. . . On the foundation deposit of Naram-Sin, son of Sargon, not a finger’s breadth too wide or too narrow, I laid [the temple’s] brick work. . . . The inscription in the name of Naram-Sin, son of Sargon, I found and did not alter. I anointed it with oil, made offerings, placed it with my own inscription and returned it to its original place” (Beaulieu COS). Figure 4: Victory stele of Naram-Sin 9062.jpg by Rama, Wikimedia Commons, CeCILL. The Cylinder in Glencairn was probably deposited with similar ritual fanfare in the foundations of a temple, palace, or armory (purchased on the antiquities market, we do not know the original archaeological context). 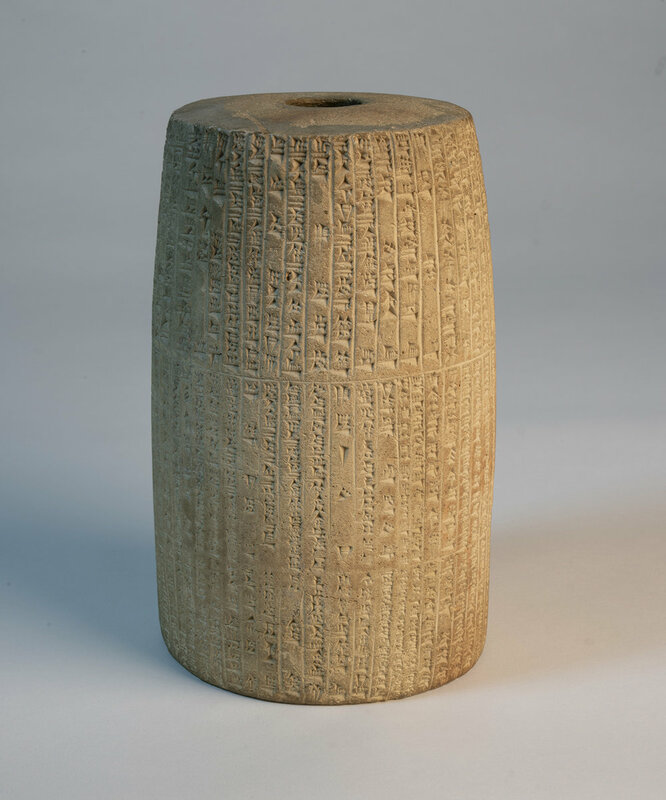 It is one of a number of copies of the same composition,1 produced so that multiple cylinders could be deposited in various buildings throughout the city of Babylon, whose renovation it celebrates. This closing paragraph tells us a great deal about the purpose of creating and burying the Cylinder, and its role in a wider Mesopotamian tradition that mediated between past and present, connected kings to gods and to each other, and upheld sacred spaces. “Just as I found an inscribed object be[ar]ing the name of [Senn]acherib, the father of the father who had engendered me, anointed (it) with oil, made an offering, (and) placed (it) with an inscribed object bearing my name, you should be just like me, find an inscribed object of mine and (then) anoint (it) with oil, make an offering (and) place (it) with an inscribed object bearing your name. May the great gods, as many as are recorded on this inscribed object, constantly bless your kingship (and) protect your reign” (Trans. Novotny and Jeffers; RINAP 5 3 viii 78-86). Figure 5: Gypseous limestone relief of Babylonian captives, from the courtyard of the North Palace of Ashurbanipal. Neo-Assyrian, seventh century BCE. In Glencairn’s Ancient Near East gallery (09.SP.1552). “(As for) the one who destroys an inscribed object bearing my name or bearing the name of [my] gra[ndfather, makes (it) disapp]ear by some craft[y] device, (or) does not place (it) with an inscribed object bear[ing] his [name], may the great gods of heaven and netherworld overthrow his [ki]ngship (and) [m]ake his name (and) seed disappear from the land” (RINAP 5 3 viii 87-92. Accessed October 13, 2018. http://oracc.iaas.upenn.edu/rinap/rinap5/Q003702/html). As Ashurbanipal and Nebuchadnezzer’s own inscriptions show, an address to future rulers who might find an inscription was not a rhetorical fantasy. This kingship practice (renovating temples and palaces, digging down to foundations, looking for foundation deposits) was so enduring that rulers felt secure in anticipating that, just as they found and honored Naram-Sin’s inscriptions after millennia, future rulers would someday do the same for theirs. Similar practices around building and dedication endured for millennia, so that kings separated by thousands of years, by languages or dialects, were alike in burying inscribed objects in the same bits of ground. Ashurbanipal’s anticipation of a future ruler finding his inscriptions was correct: Neo-Babylonian Nabonidus would also write of discovering Ashurbanipal inscriptions when renovating temples. But Nabonidus was not the grandson or great-grandson Ashurbanipal had cast in the role. In fact, Ashurbanipal would probably have been sorely disappointed to learn that the future ruler he was addressing was not his own descendant, but a Babylonian whose empire was built out of the destruction of Ashurbanipal’s own Assyrian Empire. Nonetheless, Ashurbanipal could take comfort in the fact that his instructions were followed all the same: Nabonidus did indeed anoint his image and return it to its place. Nabonidus saw himself as participating in the same cultural, religious, and royal traditions as Ashurbanipal, even though his Babylonian predecessors had been enemies of Assyria. Figure 6: Gypseous limestone relief of soldiers in a chariot, from the North Palace of Ashurbanipal. Neo-Assyrian, seventh century BCE. In Glencairn’s Ancient Near East gallery (09.SP.1552). Perhaps a good way of understanding how such traditions endured for so long across political ups-and-downs is to think about how certain traditions promote their own continuation. If a text and a practice deliberately orient themselves towards the future, is it any surprise that the future takes notice? And is it any surprise that kings who have seen this future-orientation work (Naram-Sin really is still remembered and honored) will emulate it themselves? When a king found the monuments of his predecessors and honored them, he participated in a sort of insurance system: if he did it, it would remain a vital part of “practicing kingship,” and someday the same honor would be given to him by future kings. At the same time that kings oriented their texts towards the future, they were also in dialogue with the ancient past, as we have seen already. It was no coincidence that Neo-Babylonian kings discovered ancient foundation deposits. As their own inscriptions explicitly indicate, they were looking for them. When renovating a temple, kings across Mesopotamia agreed that it was important to dig down to its original foundations and build from this plan (even if the temple was being expanded radically). A religious tradition that emphasized the importance of foundations (in the most literal sense) was another driver of certain types of extraordinary continuity in ancient Mesopotamia. In the longest-occupied sites in Mesopotamia, like the cities of Eridu and Uruk, we find sequences of sacred buildings superimposed on each other in the same precise spots over thousands and thousands of years—in these cases stretching back well before the invention of writing in the late fourth millennium (Roaf 1990: 52). These ancient excavations, repeated later by archaeologists for very different purposes, were a vital part of building temples, keeping sacred space sacred. It often seems extraordinary, even unbelievable, to modern readers that long, carefully inscribed texts like the Nebuchadnezzer Cylinder were deposited in the ground. Why go to all this trouble only to deposit a text where no one could read it? In order to understand these traditions, we need to think about the various purposes of creating written texts. It is already apparent from the discussion above that the inscriptions on foundation deposits would have had powerful effects even if no human eyes could read them. The primary intended audience of texts like these was two-fold: 1) future rulers who, as we have seen, could find and read them during building renovations, and 2) the gods, who could read texts even when they were buried. Through these long texts, the gods were informed of royal achievements, and reassured that the king acknowledged the importance of divine support for those achievements. The text on the Nebuchadnezzer Cylinder emphasizes that the rebuilding of Babylon is an act done for the gods, and asks that they bless Nebuchadnezzer’s reign in return. The Cylinder functioned then as a powerful object, promoting divine protection for the royal depositor now, and into the far future. This is why it was so important that future rulers not disrupt its magical benefits by destroying or removing it. Figure 7: Foundation cones dedicated by king Entemena of the city of Lagash. Terracotta, Early Dynastic II, circa 2500 BCE. In Glencairn’s Ancient Near East gallery (01.IS.34-37). Although the Nebuchadnezzer Cylinder is by far the longest text in the Glencairn collection, it is not the only one that would have been written and then deposited somewhere where no (human) eyes could read it. Glencairn also possesses a number of inscribed clay foundation cones. Cones like these exist in great quantities from various times and places within Mesopotamia. These pegs come in an array of sizes and styles, although all of them are variations on the same basic shape, with a short inscription looping around the side. These cones were driven into the walls of temples, the inscriptions, again, out of sight. The earliest cones at Glencairn were dedicated by a king called Entemena of the city Lagash (Figure 7), who ruled around 2500 BCE, during the Early Dynastic period, when the first texts that we would refer to as royal inscriptions emerge. As with Nebuchadnezzer’s Cylinder, the inscription is self-referential. Written in Sumerian (a linguistic isolate), it reads in part, “For (the gods) Inanna and for Lugalemush, Entemena, the governor of Lagash, built their beloved temple, the Emush. He ordered inscribed nails (be placed there).” As with Nebuchadnezzer’s Cylinder, where one composition was copied onto multiple cylinders, the inscription on the Glencairn Entemena cone is not unique—multiple cones dedicated in the walls of Emush, a temple in the ancient city of Bad Tibira, bore the same inscription (for instance, this cone in the Harvard Art Museum). Another Glencairn foundation cone (Figure 8) from a later ruler of Lagash, Gudea (2144-2124 BCE), was dedicated at the site of Girsu, modern-day Tello: “For the god Ningirsu, the powerful warrior of the god Enlil, Gudea, the ruler of Lagash, has brought forth that which is everlasting, rebuilt for him (Ningirsu) his ‘House with the white Anzu Bird’ and restored it.” This cone, gifted to the Museum in 1936, also has “siblings”—including one that was recently returned to Iraq after a high-profile effort led by the Iraqi Embassy in Britain and the British Museum to restore looted materials seized from a London antiquities dealer in 2003. It is not surprising that the origin of the cone could be successfully identified, since foundation cones’ inscriptions mention the temples they were embedded in. Figure 8: Foundation cone dedicated by Gudea, ruler of the city of Lagash. Terracotta, Ur III, circa 2500 BCE. In Glencairn’s Ancient Near East gallery (01.IS.72). The shape of these cones was designed to simulate a builder’s nail or peg (they are sometimes also called “foundation pegs” or “foundation nails” in scholarly literature). You might not want to take a hammer to a clay peg or let it bear any structural weight, but the symbolism of their shape is clear: they are the nails that hold the building together. Although the cylinders that Nebuchadnezzer buried do not imitate the shape of building materials, they “anchor” a building in a similar way: they too are part of the construction material. Now on display in Glencairn, these cones and Nebuchadnezzer’s Cylinder are removed from their intended contexts as building blocks of royal or sacred structures. Their inscriptions, implicitly or explicitly, reference sacred spaces which they are no longer a part of. The shared cultural traditions around kingship, sacred space, and memory that prompted Nebuchadnezzer and Nabonidus to anoint and re-bury Naram-Sin’s inscriptions have not endured forever. Today, we have different intentions for excavated artefacts. The Nebuchadnezzer Cylinder was sold to the Academy of the New Church in Bryn Athyn for $1,200 in 1928 (in contrast, some of Glencairn’s cuneiform tablets were purchased for as little as $4; see Figure 10) by Edgar James Banks (Figure 9), an archaeologist sometimes credited as an inspiration for Indiana Jones. Like that fictional hero, Banks believed that antiquities “belong in a museum,” and sold the Cylinder to Glencairn over a better offer from a private collector in Chicago. (“It is a rare museum piece, and should be only in a museum or school, where it may be seen and appreciated by many”—Banks to Reginald W. Brown, 10/21/1927). Museums think about past, present, and future in their own ways. Curators work to continually improve resources for teaching and research about the items in their care, host researchers from around the world, and undertake conservation to ensure the survival of artefacts in their collection. Museums also, unavoidably, exhibit objects removed from the contexts where, in the case of foundation deposits, they were powerful and effective (risking ancient curses in the process, and going against the wishes of their depositors). Figure 10: Cuneiform tablet in unopened envelope; receipt for six copper hoes. Terracotta, Ur III, circa 2046 BCE. In Glencairn’s Ancient Near East gallery (01.IS.48). 2,500 years ago when Nebuchadnezzer wrote about “distant days,” he could not have anticipated that someday his Cylinder would be on public display in a museum in Pennsylvania. Mesopotamian kings hoped to control how their inscriptions would be treated after they were gone—but the future is unpredictable, and ultimately uncontrollable. Stripped from its sacred context, displaced in time and space, the Cylinder on display in Glencairn might not evoke the religious awe that Nebuchadnezzer undoubtedly felt gazing at the inscription of his ancient predecessor Naram-Sin. But it can perhaps do something similar: connect us to a past whose legacy we still live with, and remind us of our place in a span of time that stretches immeasurably far back, and immeasurably, uncontrollably forward. 1 Although never published, the Glencairn Cylinder corresponds to a text that appears across several dozen published cylinders (Da Riva 2008: 120-121, C32). Bahrani, Zainab. 2014. The Infinite Image: Art, Time and the Aesthetic Dimension in Antiquity. First edition. London: Reaktion Books. Beaulieu, Paul-Alain. n.d. “The Sippar Cylinder of Nabonidus (2.123A).” In Context of Scripture Online, edited by William W. Hallo. Accessed August 31, 2018. http://referenceworks.brillonline.com/entries/context-of-scripture/the-sippar-cylinder-of-nabonidus-2123a-aCOSB_2_123A. Da Riva, Rocío. 2008. The Neo-Babylonian Royal Inscriptions: An Introduction. Münster: Ugarit-Verlag. May, Natalie Naomi. 2013. “‘I Read the Inscriptions from before the Flood ...’ Neo-Sumerian Influences in Ashurbanipal’s Royal Self-Image.” In Time and History in the Ancient Near East: Proceedings of the 56th Rencontre Assyriologique Internationale at Barcelona, 26-30 July 2010, edited by L. Feliu, A. Millet Albà, J. Sanmartín, and J. M. Borrás Llop, 199–210. Winona Lake: Eisenbrauns. “Nippur - Sacred City Of Enlil | The Oriental Institute of the University of Chicago.” n.d. Accessed August 31, 2018. https://oi.uchicago.edu/research/projects/nippur-sacred-city-enlil-0. Roaf, Michael. 1990. Cultural Atlas of Mesopotamia and the Ancient Near East. New York: Facts on File. Schaudig, Hanspeter. 2003. “Nabonid, der ‘Archäologe auf dem Königsthron’: Zum Geschichtsbild des ausgehenden neubabylonischen Reiches.” In Festschrift für Burkhart Kienast: zu seinem 70. Geburtstage dargebracht von Freunden, Schülern und Kollegen, edited by Gebhard J. Selz, 447–97. Münster: Ugarit-Verlag. Tsouparopoulou, Christina. 2014. “Hidden messages under the temple: Foundation deposits and the restricted presence of writing in 3rd millennium BCE Mesopotamia.” In Verborgen, unsichtbar, unlesbar – zur Problematik restringierter Schriftpräsenz, edited by Tobias Frese, Wilfried E. Keil, and Kristina Krüger, 17–31. Berlin: De Gruyter. Photography by Edwin Herder unless otherwise indicated.